Four-string, five-string, active and passive pickups, fretted, fretless... as we know that all of these terms can be confusing for beginning bass players, we have put together the following advice for choosing your bass guitar. But if you would still like to talk to someone about selecting a bass guitar, call our toll-free line at 020 8089 1481 (Mon-Fri 9 a.m.-5 p.m.), or write us at our email address . The absolute standard among bass guitars and the essence of the bass sound is the four-string ‘jazz bass’ guitar first released by Fender and which since then has spread to the portfolios of other makers. The jazz bass typically produces a rich, warm sound that is suitable in all music styles, making this instrument remarkably versatile. Bass guitars came on the market in the early 1950s when the American producer Fender introduced the first widely sold bass guitar, the Precision Bass. This instrument was intended as a replacement for the double bass, still commonly used at the time but which had become impractical due to its size and limited amplification possibilities. Since then, the bass guitar has become an essential part of nearly all musical styles. It is an instrument that stands on the line between the rhythm and melody components of a band. It forms the groove together with the drums and works with the guitars and other instruments to create the melodic composition of the song. It is said that the bass ‘gels’ the music, which is definitely true; as soon as you remove the bass guitar from the mix, you discover that it is completely empty. The ‘jazz bass’ type of bass guitar released first by Fender is a global standard. Soundwise, these instruments are versatile, and even total beginners can make them sound good. The name ‘jazz’ by no means implies that they are exclusively intended for this genre. Thanks to their characteristic dense sound and a combination of two single-coil pickups, you’ll find them in virtually all musical styles. The Precision Bass guitar type can be called the mother of all bass guitars; introduced on the market in the early 1950s, it is the oldest instrument of this typeand changed music forever. They typically have one divided single-coil pickup that produces the characteristic raw sound, which isn’t as round and dense as the jazz bass. The more powerful sound of the Precision Bass makes this instrument useful in almost every genre. The name of this bass guitar indicates that it is a more recent instrument than the previous two types. These basses typically have a round and massive body with a deep cutaway and long ‘horns’. Most modern basses feature active humbucker pickups (the instrument has a built-in preamp), which produces a very dense sound that is fat but not as concrete. Moreover, the active pickup of these guitars make it possible to set the equalisation (bass/midtone/treble) directly on the instrument. There are many bass guitars whose construction and shape set them apart from the main categories. These include Thunderbird basses from Gibson and Epiphone, the timeless and attractive appearance of which have delighted many generations of bass guitarists. The Hard and Heavy section contains bass guitars with sharp and aggressive shapes, and these instruments are favourites in metal bands. 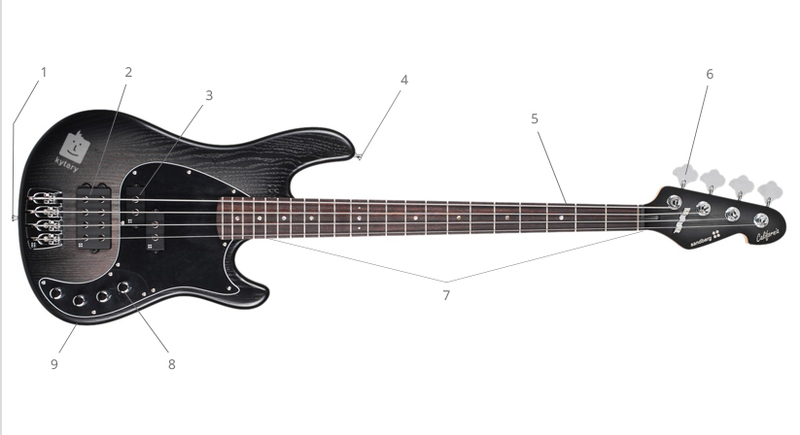 Although standard bass guitars have four strings, many players prefer instruments with five strings. Four-string basses are tuned to the tones E, A, D and G. 5-string basses also have a low ‘B’ (or ‘H’) string. As such, 5-string basses are tuned to B (H), E, A, D, G, allowing bassists to play even lower than on a standard 4-string bass. Bass guitars are divided into those with active and passive pickups. The first bass guitars were only passive, which means that the signal from the pickup wasn’t strengthened until it reached the amp. Active bass guitars have built-in preamps, so their signal is stronger, which adds to the ‘fatter’ and firmer sound. However, the sound isn’t as concrete and distinct as with passive guitars The advantage of active guitars is that these instruments usually also feature potentiometers for equalising the sound, making it possible to set the bass, midtones and treble directly on the instrument. An active pickup requires a 9-volt battery in the bass guitar (if you want to keep playing, its best to keep a backup battery on hand. Fretless bass guitars make up a special group. Like double basses, they have a ‘clean’ fingerboard on which the individual positions are at most marked with vertical lines. These instruments are used by experienced players, for example, in jazz bands. Bass guitars require a few basic accessories. First and foremost, you’ll need a cable to connect your bass to a amp. You’ll need a tuner (any clip model will do) to tune the instrument, and a strap and stand are also useful. If you plan to travel with your bass, we recommend buying a soft case (more comfortable) or a hard case (safer). If you need some help deciding which bass guitar to buy, don’t hesitate to call us on our toll-free line at 020 8089 1481 or send us an email to .